As the communist country of Vietnam increasingly embraces the ways of capitalism, the gap between rich and poor is rapidly expanding. I have had some odd days, but Sunday in Hanoi was certainly a very odd day. It started off with me gawping at a preserved and somewhat waxy-looking man, then there was a taste of Vietnam's most expensive soup - and a sight of its most costly car. I dropped in on the inaugural meeting of the Harley Davidson owners' club before getting a touch of realism, supping local beer cross-legged on the floor of a locals' restaurant. Uncle Ho Chi Minh, Vietnam's founding father, supposedly asked to be cremated rather than to lie - as he does - in the middle of a darkened mausoleum, surrounded by soldiers who impatiently usher visitors to complete one lap briskly, in silence, hands out of pockets, hats off. Hundreds of Vietnamese people - and tourists - queue all the time to see him, just as he was when he died more than 40 years ago. The Communist Party here does not like change but, with skyscrapers going up around Uncle Ho's memorial, change is coming to him. 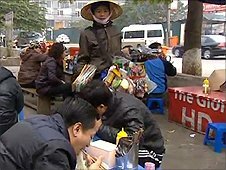 The next stop was for "pho" - the breakfast staple, a noodle soup that fuels the nation and steams from big pots in the cold Hanoi air, usually selling for $1 (£0.60) a bowl. But we were not going to any old street-food joint, we were to sample the country's most expensive pho - at $35 a bowl. Two Porsche 4x4s were parked outside the restaurant. I did not even know Porsche did 4x4s. 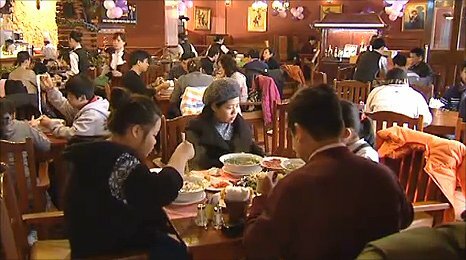 The restaurant owner talked us through the quality of his Japanese beef, the cleanliness of his kitchen and how much the rich are willing to stump up to slurp down Vietnam's priciest soup. One diner admitted he had had the house special and, when I asked him his profession, he almost apologetically told me he worked for the government. We were eyed suspiciously by a party Central Committee member slipping out of the door and into his Mercedes, as our minder sampled the produce, admitting later it was not $35 better than her usual breakfast spot. The "party" also likes to be in control. This is not a communist country that we might imagine from the 1950s or 60s. Yes, the red flags are flying - on every street corner - but the hammer and sickle flutters across the road from the Chanel store, the old-style propaganda posters on guard near Louis Vuitton. Icons of socialism and capitalism - odd bedfellows. Even the minders laugh and shrug when you ask how ideology and modern reality sit together. They seemed surprisingly straight with us - honest about the idiosyncrasies - I supposed at the very least I was expecting them to be formal and stern, maybe even evangelistic. The restaurant owner explained his interpretation: "The shell is communist but the guts are capitalist," he said. We had seen the shell - the collective of comrades at the Party Congress unanimously agreeing on the country's new leadership. "Any objections?" the speaker asked with a cursory glance. Of course not. Questioning the system is not tolerated. But then all the fighting and bickering, debating and arguing, happened behind closed doors. The appearance of Unity is Strength. And we had seen the guts - a morning with one of the country's richest men did that - his multi-million-dollar development (soon to be the tallest building in central Vietnam), his seafront hotel and condo blocks at $2m a flat, his industrial parks and his aim to make even more money by replacing the shirt and shoe factories with high-tech electronics. "If the party goes a different way from the people of Vietnam, then surely they cannot survive," he bravely quipped. And there was plenty of confidence about the 26-year-old who showed me round the custom-built Rolls Royce Phantom which stared snobbishly out of the showroom, sneering down its bonnet at the hawkers who passed by wearing their old conical bamboo hats. He oozed bling. You can afford a gold mobile phone and diamond-encrusted watch when you own a dealership selling cars as expensive as these. And the Harley Davidson club? "You'd never see so many high-end bikes in one place anywhere else in the world," one of the gnarled expat members explained to me. And it is certainly an expensive habit. Bikers are supposed to be rebellious. In a way here I guess they are, but their engines just roared money at the poor of Hanoi. A day with the haves when there are so many millions of have-nots. After the excitement, I met a local journalist for a drink. She described the intimidation and late-night calls, the phone taps and tails. Those who challenge the party end up in jail. The shell is still strong. The principles preserved in Uncle Ho's vault still prevail. There is a knack to making money here, there is a system. But as cash pours in and the economy heats up, change is unstoppable. The party can try to ride it and guide it, but it would take a firm hand indeed to hold back the tide.